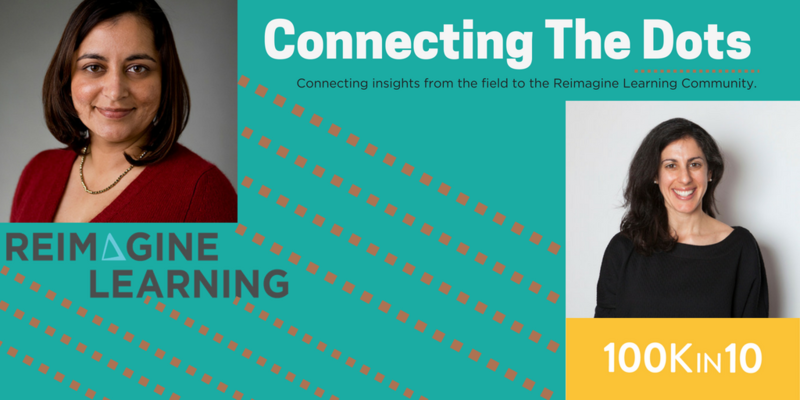 Reimagine Learning's Managing Partner, Shruti Sehra (SS), sat down with Talia Milgrom-Elcott (TME), Co-founder and Executive Director of 100Kin10, to connect the dots between the insights 100Kin10 has learned in their work to solve the nation's STEM teacher shortage and the work the Reimagine Learning community is doing to meet the needs of ALL students. SS: Reimagine Learning is made of up different organizations that came together to focus on serving students that have historically been known to be underserved, particularly students from low income families who either have learning and attention issues or who have had high exposure to trauma, so much so that its affecting their ability to learn. Could you help us translate what you learned through the process that 100Kin10 took as a part of the 2+ year "Grand Challenge" analysis to identify and map the core issues facing STEM teacher recruitment, preparation, and retention? TME: The reason 100Kin10 did the Grand Challenge mapping work was to understand the full system in order to understand and find the highest places of leverage where we could take action. In practice, we first needed to hear from all perspectives about how the system was working: what was working and what wasn’t working. When we see any issue from only our perspective, we so often miss what’s really happening, especially with the learning differences (LD) community. The risk is that we miss the most important stuff, the stuff that is hidden from us that is crucial to understanding and solving the issue. The first step is to see the whole problem in order to identify the highest leverage opportunity for action. In that work, we found a few things that are really telling. The first is that everything is connected. There are no siloed programs or problems in real life. This speaks in profound ways to the social emotional learning (SEL) and trauma communities. Science shows what is possible when we treat students as whole people. If I’m hungry, it’s hard for me to focus. If I’m anxious, it’s harder for me to remember and recall. The stuff that shows up as behavioral academics has deep roots in neuroscience, our lived experiences outside school, and our physical health. These things are real, and they’re integrated. Despite recognizing how issues are all interconnected, we haven't yet solved core education challenges at scale. If you can find places of higher leverage within the system and take action there, we have a real shot at making a difference. This is at the approach level that anyone can do to tackle a set of problems. At the content level, we found a few things that would be of real value to the Reimagine Learning community. Among more than 100 root causes behind the STEM teacher shortage that we identified, the most important ones had to do with school culture. This is relevant to all these communities—it cuts across every community in education. What’s happening in the schools for adults matters deeply to what happens to kids. This is like business management 101, but it’s truly radical in the school context. Companies are coming up with innovative ways to ensure that their employees are well cared and happy. They know they can’t provide excellence if they don’t have employees who are happy. We somehow got to thinking that we can create great human beings, citizens, leaders, and thinkers even if the employees weren’t happy. This is not true. For a long time in education reform, we thought that teacher happiness and efficacy and student happiness and efficacy were in conflict of each other. They are tightly, tightly connected. It’s not children first, it’s not adults first. It’s how we can create places where children and adults can both be learning and thriving. This has a great parallel back to SEL community. We talk a lot about SEL and growth mindset for students especially. We do not talk about it for teachers. A lot of our systems were designed assuming a fixed mindset for teachers. It’s impossible to ask someone with a fixed mindset to teach their students how to have growth mindset when they’re not experiencing it. We must create a kind of coherence that is necessary for adults to truly embrace and pass on a growth mindset for their students. SS: This gets into some of the specific strategies that 100Kin10 identified to address the STEM teacher shortage and support effective teaching. How many of these strategies are applicable beyond looking specifically at STEM teachers? TME: 50-60% of the Grand Challenges map is fully applicable across the board when it comes to addressing teacher recruiting, retention, and effectiveness. If you replace the word “STEM” with "Special Education" or “English Language Learners (ELL),” you’re looking at closer to 80-90% of the map being applicable. SS: Do you have any folks in your network that think about STEM in relationship to the types of learners that the Reimagine Learning community seeks to support: students from low income families, students with learning and attention issues, or students who have been exposed to trauma? Have any insights about that relationship shaped your work? TME: From its beginnings, the 100Kin10 network always had a focus on underserved kids and underrepresented populations of teachers. That has primarily focused on income and race, and increasingly on geography (rural as well as urban) in the last few years and on girls since gender biases are deep in STEM. A focus on underserved students and teachers has always been front and center in 100Kin10 and all the partners we’ve let in and the commitments they make. If you look on the map, there is a section outlining challenges that are heightened around bias: our expectations on who does STEM, how communities value and understand STEM, and whether parents see the importance of it. When we look at the root causes and the literature, there is a lot of salience. We have project teams, which is one of the ways we empower partners to solve problems where we take on the messy work of collaboration and they bring all the passion and wisdom. They are teams led by one person who has a problem that they solve on their own but they ask the whole network to see if anyone wants to join them in solving the problem, which is generally a team comprised of 6-10 people which focus on one challenge over a period of 6 months. There is a team right now led by the Tom Joyner Foundation and that team is working on “personally relevant pedagogy.” It's focused on STEM but it’s also widely applicable. We also have teams working on promoting STEM to girls and gender perception, and two different teams working on rural communities. SS: I’d love to hear some advice for the Reimagine Learning community from a content perspective. What have you learned, not only from the seven strategies but also from other work that you’ve been doing with the network and your organization over time? I’d also love to hear your advice from a network perspective: how to activate a network. TME: I’d say that the first piece of advice is that the problems that are worth solving—the big problems—break out of any box. They are way bigger than any one organization can tackle. They are going to require all of us. In my experience, the most motivating thing is to remember that there are these big problems that we’re trying to solve that require us to partner. The problems that this community is working on are just incredible examples of that. It’s easy to feel like the pie is small and that were fighting for scraps, but when we work together the pie can actually be bigger. The next is that we only see a part of the problem—we only see the stuff that we see. Our neuroscience conspires to reinforce that. Behavioral economics is proving over and over again that we delegitimize the perspectives that are different from our own; we don’t even see them. Frame wins over facts every time. When we do that, it's to the detriment of the problems that we’re trying to solve. This community in some ways holds that experience deeply and represents kids, people, and communities where that has happened to them, but its also easy to do. So, seek out the perspectives that are different and incorporate them into your world view, allow that to help you see the full 360 degrees, and allow that to be a powerful motivator to finding the places of high leverage where people can work together. When you find those high-leverage places, in our experience, they are places of intersection and connection because many things feed into them. They are opportunities to find allies and we all need allies in our work. At the end of the day, the success of our work will depend and be reflected in the work of this community of Reimagine Learning. I say that both as someone who has worked in education for a long time and as a parent. I’ve had the experience when people say to us, “well, STEM is easy: lots of people want to connect to STEM.” This is true in my experience because we’ve made it a big umbrella, we’ve created a big tent and invited everyone to come. The work of the Reimagine Learning community is so important, and we need to find ways to bring people in because all of us are connected to it and need to see it succeed. So how do we create bigger tents where people feel connected to this work? I think movements need to be open. I think having that aspiration is important—the sense that everyone, from the President to parents, have something to contribute to reaching this goal. That feeling and ethic pervades 100Kin10. SS: Any other final closing thoughts, words of wisdom, wishes for the members of this community? TME: My last thought is that as parents, as citizens, as being committed to education and to the success of the work of the Reimagine Learning community, we need two things. There needs to be tinkering every day to the work and there needs to be system changes that allow for the everyday tinkering to land. Individual actions, although critical, rarely add up to more than themselves if they aren’t linked together in a system. In the same way, a teacher does not transform a child’s life—it’s a series of teachers that set them up for success. It’s a series of moments that allow us to be our best selves and reach our potential. Both tinkering and system-level change are critical. A strong field has people specializing in each and everyone working to some degree on both. Take a step back and look at the field to ensure that it has people who are working to improve practices and people working on systems change. Those will function on different timelines. You need some of those everyday improvements to generate the momentum and have that feeling of victory, and to tell stories that will be emotionally resonant with people. The system work is the multi-year, decades-long work that ensures that kids’ lives change over the duration. SS: Thank you so much for your time. I appreciate your inspiration to our community.